I’m at 3.5 years of working out and decided I needed to review ways that I’m tracking my progress. The scale is a daily friend. I’ve had the one pictured above for over a decade and it’s been with me through moving into my first apartment, second apartment, across the country, and into married life. I hang on to it because it’s consistent. I use the same one in the same place on the floor in our house and weigh first thing in the morning. Any increase used to bum me out but now it just tells me how I ate the day before. Too much salt? Too many bloating foods? Super clean and healthy? It also tells me fat % and even if it’s not perfect using the same scale keeps it consistent. Sleep. I wear a Fitbit flex (more info tomorrow for Tech Tuesday!) to track my sleep. My goal is 6 hours but sometimes I’ll add a little more if the girls are sick, I’ve had hard workouts and need a little more rest, or if I just need it. Measuring tape. I always measure before and after a new workout schedule. Sometimes the measurements change a lot, sometimes they barely move. It’s another thing I track to see how things are changing. Labs are essential for me. I am doing this whole healthy lifestyle thing because I’m fighting full blown diabetes (right now I’m a recovered insulin-dependent gestational diabetic who is “glucose intolerant” or “prediabetic.”) I don’t test every morning but will periodically spot check my fasting levels. It helps me know how I’m doing with nutrition and also reminds me I don’t want to have to do this multiple times a day. Those are my top 4. 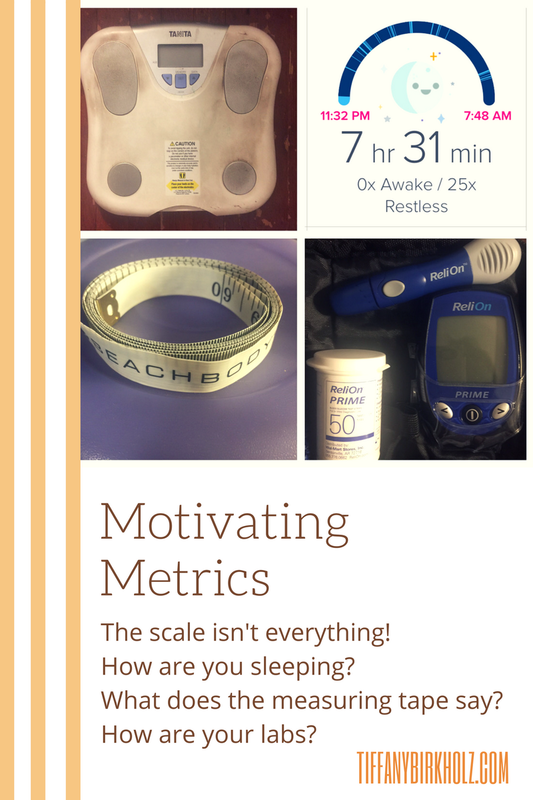 Which things do you measure to track progress?